Mastering CodingBat (Java), Vol. 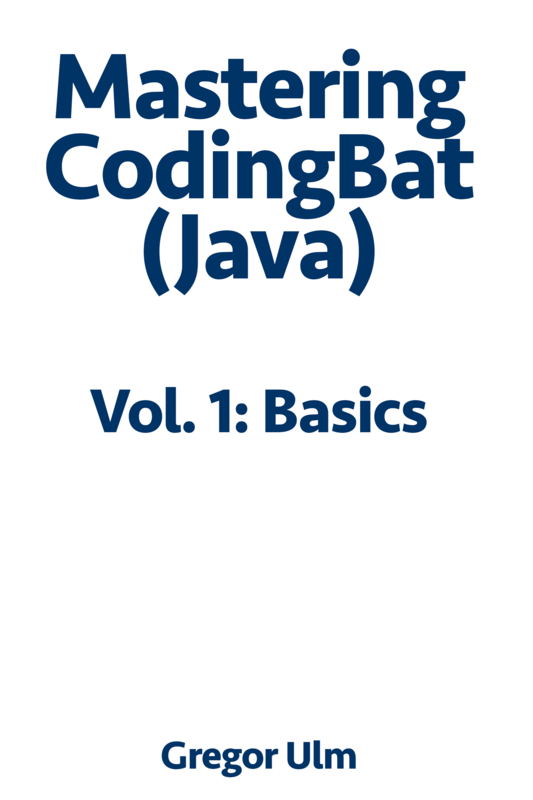 1: Basics is the first book in my four-part series on the Java sequence of Coding Bat programming problems. In total, this amounts to 121 problems. There are over 350 code listings. Each problem is carefully explained. Hints are provided. Each problem comes with a sample solution, including explanations. A large number of problems also has an extensive discussion associated with it, in which I elaborate on different approaches. Here is a sample PDF with the full table of contents and two problem discussions. 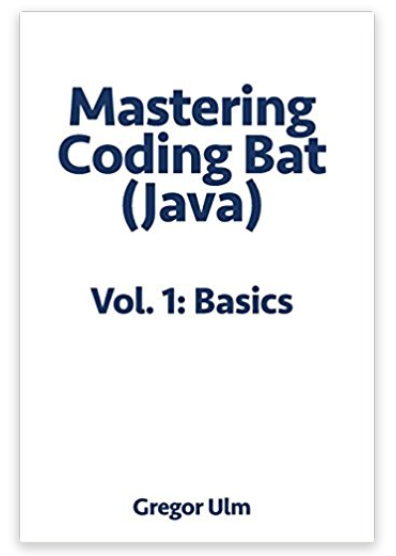 You can order Mastering CodingBat (Java), Vol. 1: Basics online on Amazon.com, or the various international sites, for instance Amazon.co.uk. It is available in both a paperback and ebook edition. The latter can be read either on Kindle ebook readers or on the free Amazon Kindle reader app, which is available for phones and computers. You can also order the paperback edition at your local bookstore if you give them the ISBN number, which is 978-3942017107. That’ll probably be a more expensive option. Also, note that this is a print-on-demand book. If Amazon is out of stock, just order it. It’ll be printed within one or two days and will quickly be on its way to you.